The Tozai Line is one of two subway lines operated by Kyoto Municipal Subway. The line runs east to west through central Kyoto between Rokujizo Station and Uzumasa Tenjingawa Station. “Tozai” literally means “East-West”. At Karasuma Oike Station it connects with the other subway line, the Karasuma Line, which runs north to south, and this gives you access to Kyoto Station. Tozai Line Ticket Machines at Sanjo Keihan Station. The Tozai Line is useful for getting from the center of the city to sightseeing districts like Higashiyama in the east and Nijo Castle in the West. At Uzumasa Tenjingawa station you can also transfer to the Keifuku Randen Line to access Arashiyama in the west or Kinkakuji Temple (the Golden Pavilion) in the north. To access the Tozai Line from Kyoto Station take the JR Sagano Line to Nijo Station and then transfer. There are 17 stations on the Tozai Subway Line. They are all numbered with the letter T. The following are the stations you are most likely to visit running east to west. This is the first station on the Tozai Line. Here you can transfer to the JR Nara Line and Keihan Uji Line. Exit here for UNESCO World Heritage Site Daigoji Temple. This temple is famous for its five storey pagoda and for the Bentendo Hall which, viewed from across a pond, is particularly stunning when surrounded by autumn colors. Exit here for Kajuji Temple and Zuishinin Temple. Both of these ancient temples are known for their gardens. Kajuji is especially famous for its water lily pond, and Zuishinin is famous as the last home and refuge of the 9th century court beauty and poet, Ono no Komachi. Transfer here to the JR Biwako Line, the JR Kosei Line and the Keihan Keishin Line. Transfer here to the Keihan Keishin Line which runs between Misasagi and Hamaotsu Station in Otsu, the capital city of Shiga Prefecture. Exit here for Kyoto International Community House, the Westin Miyako Hotel, and the great temple complexes of Nanzenji and Eikando Zenrinji. To the north of Higashiyama Station is the museum district of Okazaki, Heian Jingu Shrine, and Kyoto Zoo. To the south are the many temples of the southern Higashiyama sightseeing district. Head east from this station and you can access the northern part of the Gion entertainment district and Heian Jingu Shrine. To the west, across Sanjo Bridge, you have immediate access to the Sanjo and Kawaramachi shopping districts, and the historic alley of Pontocho. You can also transfer here to the Keihan Main Line. 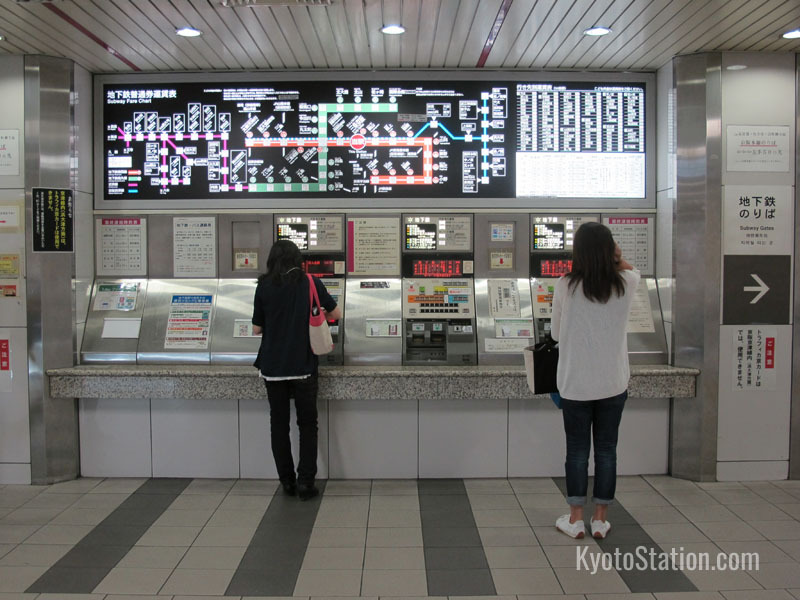 From this station you can access Kyoto City Hall and Kyoto Hotel Okura. 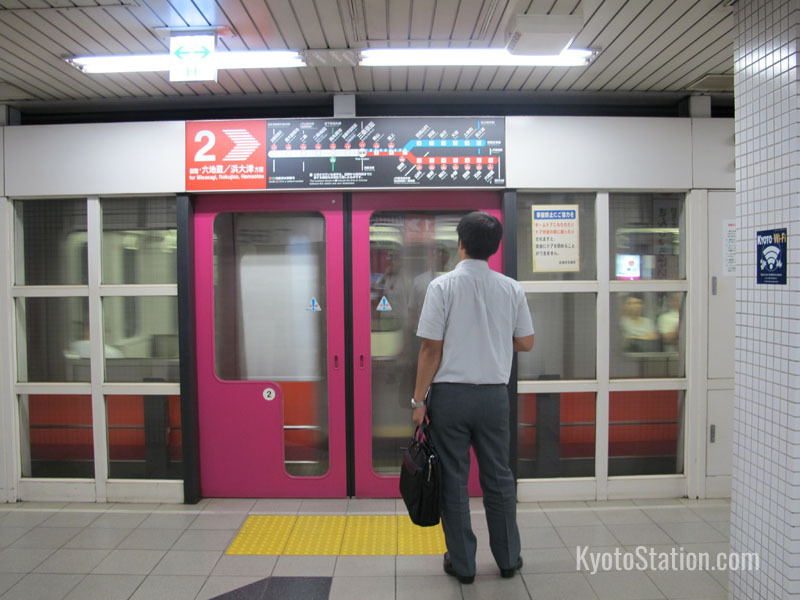 This station also gives easy access to the Kawaramachi and Teramachi shopping streets. This station lies under the intersection of Karasuma Street and Oike Street. Exit here for The Museum of Kyoto, Kyoto International Manga Museum, and the Shinpuhkan Shopping Center. Transfer here to the Karasuma Subway Line. This is the closest station to Nijo Castle, a UNESCO World Heritage Site which dates from 1603. The castle grounds contain several beautiful buildings of historical and architectural interest as well as extensive gardens which are famous for their plum and cherry blossom in the spring and maple leaves in the autumn. Transfer here to the JR Sagano Line that runs between Kyoto Station and JR Saga-Arashiyama Station. This is the last stop on the Tozai Line. The big attraction here is the Toei Uzumasa Eigamura theme park also known as Toei Kyoto Studio Park. This theme park is also a working film set used to make historical dramas, usually featuring samurai warriors of the Edo era. Among the attractions are sword fighting displays, ninja performances, a maze and a haunted house. It is also possible to dress up in costume and watch the filming of TV dramas and movies. Transfer here to the Keifuku Randen Line for connections to the Arashiyama district or Kinkaku-ji Temple (the Golden Pavilion). 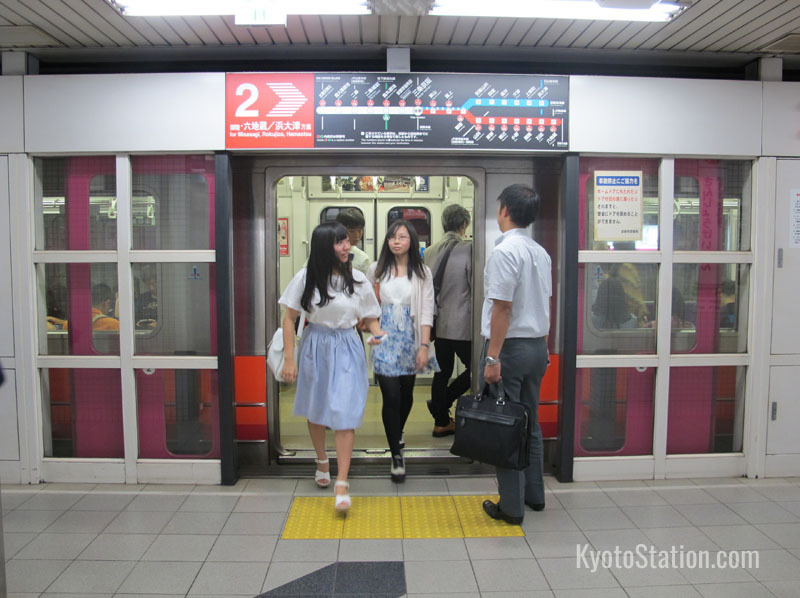 The Kyoto Municipal Subway One-day Pass gives unlimited travel on the Tozai and Karasuma subway lines. It is priced at 600 yen for adults and 300 yen for children. The Traffica Kyoto Card is a prepaid card you can buy for 1000 yen for children and 3000 yen for adults. This will give you a 10% discount when you ride Kyoto City Buses and the Kyoto Municipal Subway. This is available from Kyoto City Bus and Subway vending machines and ticket offices. 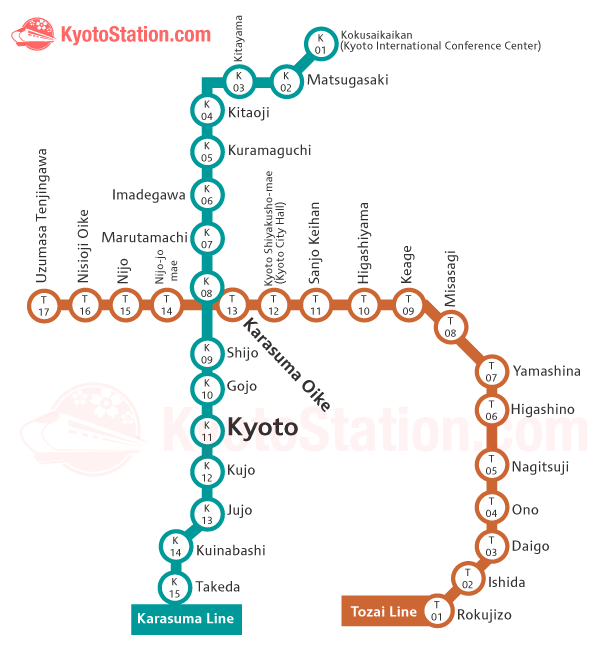 To see how the Tozai Line connects with the rest of Kyoto’s rail network, you can download a free route map of Kyoto’s complete train and subway system.